One of my favourite subjects, Gin is now enjoying a renaissance. With it comes not only a proliferation of small batch distillers, but also a flurry of media attention. 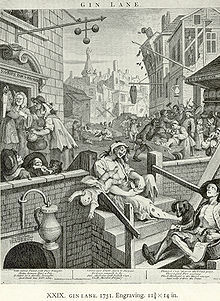 I was thrilled to hear a programme recently on Radio 4 detailing this revolution, based in the Museum of Gin (the 'Ginstitue' on Portobello Road). This kind of interest in not only the quality of Gin, but also its provenance and production methods is highly encouraging. We are moving away from the 18th Century perceptions of Gin as 'mother's ruin', and to a 21st Century embodiment of an artisanal delicacy. I'm pleased to note my three favourite distillers all get a mention in the show (Sacred, SipSmith, and Bruichladdich). I highly recommend taking 25 minutes out of your day to listen to the programme, available on the Radio 4 website here. Dan Saladino presents the show, featuring Nick Strangeway, Jake Burger and Victoria Moore, and manages to really get under the skin on this newly revived delight.